A world government group called the World Service Authority has their own flag on-line. I don’t know the reason for the yellow field. This flag is shown at the World Service website as «World Citizen flag», along with a picture of this flag. Other pages at this website show the flag as well. 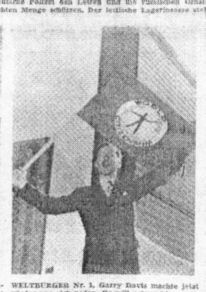 A German newspaper (Passauer Neue Presse 6 March 1954) mentions the “first world citizen”, Garry Davis, waving the flag of World Citizenship in front of UN HQ at New York (see photo). This guy is still alive 50 years later; at the World Service website one can see the current version of the flag behind him.